Banana bread isn’t a particular favorite in my book, mainly because I’ve either bought or experimented with recipes that were disappointing. The commercial variety inevitably taste over-banana-ed, no doubt because they’re chock-full of additives and artificial flavors. Like fake grape products, counterfeit banana tastes like kiddie cough syrups and other over-the-counter cures. My pickle with the recipes I’ve tested is that they’re usually rubbery or dry as a bone. Enter Nancy Silverton and her glorious book, Pastries from La Brea Bakery. Looking through her recipes I came across banana nut loaf, and thought, “Hey, if anyone can make a good banana nut loaf, if anyone can redeem it, it’s Nancy Silverton.” So I bought some bananas and patiently waited for them to get nice and black outside. Today, when the bananas, at last, were mature enough, I mashed them up and mixed them in with heaps of chopped, toasted nuts and spices. 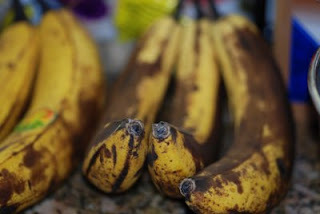 Make sure bananas are really ripe. 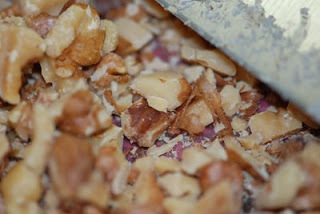 DO chop the nuts with a knife – using the food processor will leave behind uneven pieces and nut powder. Things got off to a good start, because even as I began chopping the nuts, their toasted scent reached my nose, mingling with the heady aroma of ripe bananas; they were perfectly matched. My skepticism over banana bread waning, I caught myself anticipating a sweet reward, and Nancy delivered. What came out of the oven was darkly tanned on the outside and moist inside. 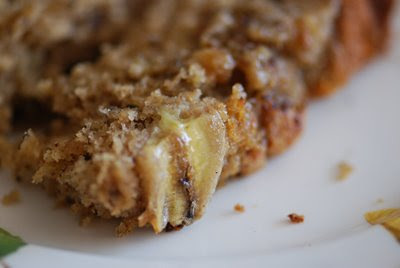 The cinnamon, cloves, and nutmeg provided warmth as well as refinement – this banana nut loaf is for grown-ups, a far cry from those cheap attempts you may be used to eating. Adjust the oven rack to the middle position and preheat oven to 325˚F. Spread the nut on a baking sheet at toast in the oven until lightly browned, about 8 to 10 minutes. Shake the pan halfway to ensure the nuts toast evenly. Cool, chop coarsely, and set aside. Turn the oven up to 350˚F. In a medium bowl, whisk the banana puree, eggs, and vanilla to combine. In the bowl of an electric mixer fitted with the paddle attachment, cream the butter, baking soda, baking powder, salt, cinnamon, nutmeg, cloves, and poppy seeds on low, 2 to 3 minutes, until softened. Add the sugars and turn the mixer up to medium, mixing another 3 to 4 minutes until fluffy, scraping down the sides of the bowl as needed. Add the flour and banana mixture alternately in 3 batches, beginning with the flour. 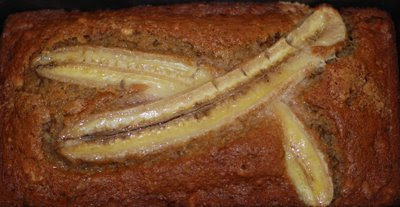 Cut two ¼” strips from the additional banana, slicing down the entire length. Arrange the two C shapes on the top the loaf, staggered, with the two ends slightly interlocking with other in the center. Sprinkle about 1 tsp. of granulated sugar over the surface. Bake for 50 to 60 minutes, until nicely browned and firm to the touch. The bananas on top were amazing.